Granite is one of the most durable stone types around. If you are considering installing a fountain in your landscape, consider choosing granite. This article explains why granite fountains are superior to fountains made from other materials. 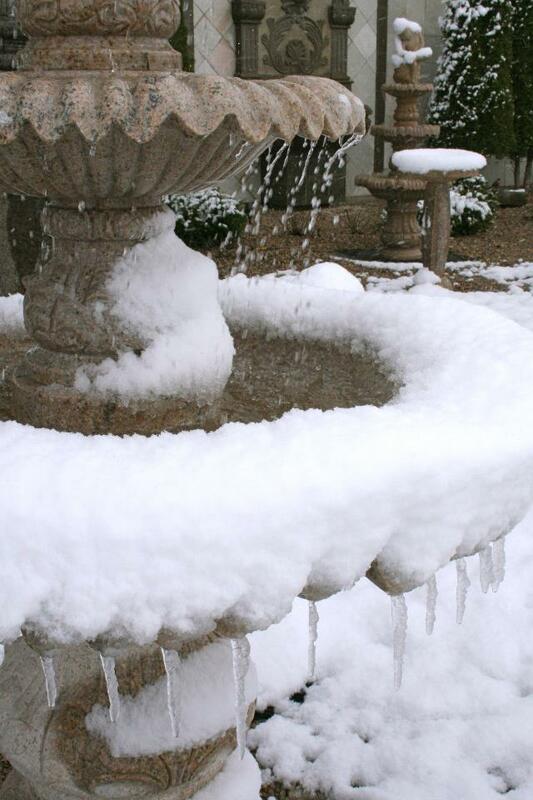 Even if you do live in a warmer climate, a granite fountain still may be the best choice for you. Keep reading to learn more. Granite is one of the densest stones available. Given that this material is dense, it is very porous, meaning having very small holes or gaps that could trap water and eventually freeze and expand causing cracks. Granite fountains can stay uncovered outdoors year-round, giving you a chance to enjoy your stone investment through all seasons. All granite countertops are not affected by acid. Which means you can effortlessly clean up algae stains or hard water deposits with a dilute solution of muriatic acid without fear of damaging your granite fountain. Cast stone is a man-made material from limestone cement. This is made with a mix of pigments and crushed stone that is molded into a form to make it look like a natural stone fountain. Although cast stone is often less expensive than natural stone fountains, it is much less durable. Cast stone wears down much quicker than granite because it is a porous material. As water seeps into the gaps in the stone and then freezes, it expands resulting in cracks and crumbling. This has been shown to happen in as little as only 1-3 seasons making the total cost of ownership for a granite fountain much more economical over time. Another downside to cast stone is that you don’t get a one-of-a-kind look. Cast stone is made by a limited set of existing mold forms. You don’t get the ability to personalize a one-off fountain like you can with natural stone. Unlike the veining and natural textures in granite, where no two fountains are exactly alike, the painted finish on many cast stone fountains looks similar; at least until they start to fade, chip and peel. Other stone types like limestone, travertine or sandstone may be used for fountains too; however, they aren’t always the best material choice. Some types of stones are not as dense as granite and they are of more porous material that can absorb water. You should not use these types of stone in fountains. The softer and more porous nature of these stones causes them to show wear quicker than a granite fountain. For further details just contact us. See your granite fountain in front of your home before you purchase with our free Photoshop presentation.